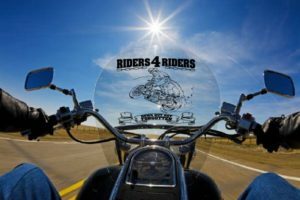 Rider 4 Riders, formed in 2010, is a “Non Profit Organization” of volunteers dedicated to assist motorcycle riders injured or families of those lost due to a motorcycle accident at no fault of their own. First and foremost our goal is to educate the public and promote motorcycle awareness throughout the community. Applicants are not required to be a member of this organization to receive assistance. Many injured riders and/or their families require immediate assistance meeting financial obligations and personal needs. This may include household expenses as well as cleaning, laundry, meals, food, transportation to/from doctor/hospital appointments, babysitting, cooking, medical equipment, spiritual needs, or something as simple as a phone call or personal visits. Although fund-raising events may be planned to aid someone (which our rider community generously does so often), it takes weeks to organize these events properly. This is where our Riders 4 Riders volunteers are willing to step up and offer immediate assistance. Anyone that Riders 4 Riders provides assistance to will be encouraged, once they are able, to “Pay It Forward” and join us in our endeavors to help others in need. Membership is open to any adult 18 year or order, who wishes to make new friends and participate in social, civic activities, or just wanting to help your fellow riders. It is not required to own or even ride a motorcycle to become a member or attend any of our events. Yearly Membership fees are as follows, Single $20 per person donation per year or $30 per couple donation per year. Our members participate whenever possible in benefits or rides organized by others, for those in need in our local community. We serve Mobile, Baldwin, and Washington County AL, Forrest, Green, Jackson, Harrison, George & Stone County, MS and Escambia County FL. Financial aid and personal assistance will be dependent upon available funds, donations and volunteers. We are also recruiting other business sponsors willing to hold meetings, fundraising events, as well as to donate resources, such as advertising, prizes, goods and services and any funds. Folders with the organization’s information are available for review upon request. Please use the links on this page to learn more about Riders 4 Riders (www.r4rmobile.org), or our Facebook page www.facebook.com/R4RMobile for current meeting information and events and join us in our endeavor to assist those in need of our support. Riders 4 Riders is a non-profit organization created to financially and/or personally aid those injured or families of those lost due to a motorcycle accident. First and foremost, our goal is to educate the public and promote motorcycle awareness throughout our community.